Twenty members of the Kenyon College family participated in the alumni travel program, “The Art and Literature of Cuba: An Insider’s View” in early June. Highlights included visiting the Ludwig Foundation for the Arts, and the Contemporary Dance Company of Cuba and meeting notable authors, poets, architects, and artists. Destinations visited included the cities of Havana, Cienfuegos, and Trinidad. Kenyon is exploring the possibility of a return trip in January of 2014. 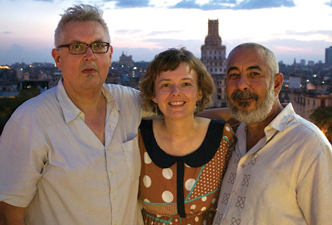 Pictured at right: Associate Professor of Spanish Victor Rodríguez-Núñez, Associate Professor of Spanish Katherine Hedeen, and noted Cuban journalist and author Leonardo Padura (Havana Blue). Join a Kenyon crowd to watch Liberal Arts, the made-at-Kenyon film created by Josh Radnor ’96. The film opens on September 14, and the College has reserved blocks of tickets at screenings around the country to bring Kenyon people together, with social gatherings planned before or after the film. Go to alumni.kenyon.edu to register for a social event and reserve a ticket for the film. Here’s a tentative list of screenings. Details are subject to change, though, so be sure to check alumni.kenyon.edu. Kenyon’s Learning in the Company of Friends kicks off for another year this fall, with visits in Atlanta, Raleigh-Durham, Philadelphia, Baltimore, Denver, Cincinnati, Washington, D.C., and Chicago. Join your fellow alumni and favorite Kenyon professors for stimulating talks and good company. Go to alumni.kenyon.edu for more information about these programs and to register. The event is billed as a “spectacular festival of epic proportions”—and it does promise to be fun, meaningful, memorable, and surprising. “Same As It Ever Was: The K80s Event” will take place June 27-30, 2013, on the Hill, and it’s open to anyone who went to Kenyon anytime in the 80s. This first ever all-1980s gathering in Gambier is brought to you by the Kenyon (1980s) Facebook group. This vibrant grassroots community, founded in December 2010, now boasts over 1,700 members. Everyone from the class years 1980-1993 is welcome, whether they are part of Facebook or not. For those who are, search Facebook for “Kenyon (1980s)” and join the group. You’ll get all the latest updates on the wild schedule the team is cooking up through the Events page. Want to go? Registration and a full schedule of events will be available on April 1, 2013. The female members of the class of 1972 were invited to participate in a special matriculation ceremony during their fortieth reunion. The women were among the first to graduate from Kenyon but were awarded diplomas from the Coordinate College. Five women took Kenyon’s oath of matriculation and signed the matriculation book in the Greenslade Special Collections and Archives. 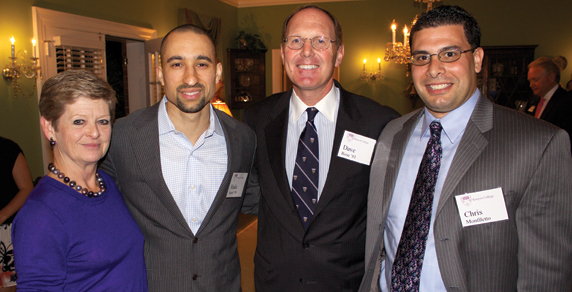 The women were joined and supported by more than thirty of their male classmates, as well as other Kenyon alumni. Their matriculation was also celebrated by President S. Georgia Nugent at the annual Gregg Cup Luncheon. 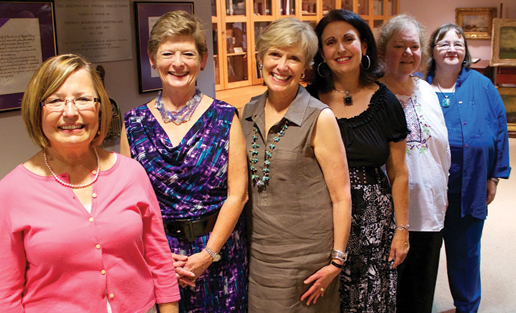 Pictured left to right: Paula Siegel Barone, President S. Georgia Nugent, Nancy Peek Ellis, Sara Elizabeth Sedgwick, Roberta Hilt Fancher, and Susan Emery McGannon. A Learning in the Company of Friends regional event was held in Richmond, Virginia, in May at the home of David ’81 and Linda Rose. The featured speaker was celebrated basketball coach Shaka Smart ’99. Pictured above are Kenyon President S. Georgia Nugent, Smart, David Rose ’81, and Kenyon’s new head football coach, Chris Monfiletto. 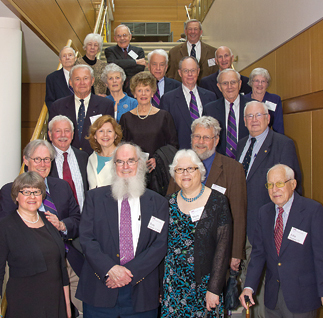 Members of the Classes of 1937, 1957, and 1958 gathered in April to celebrate their Post-Fifteith Reunion. Additional photos are available at alumni.kenyon.edu.